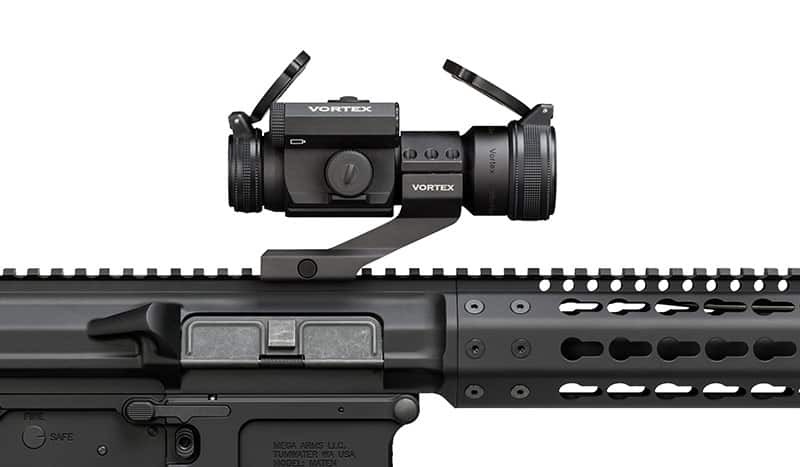 Both Vortex and Aimpoint are some of the best-known optics manufacturers for any type of shooting. Vortex provides a lot of different shooting optics for reasonable prices. Aimpoint is known for their red dots that are built to last and to survive pretty much anything you can put an optic through. But, that comes at a price. Due to these attributes, Aimpoint is used by law enforcement and military forces around the world. 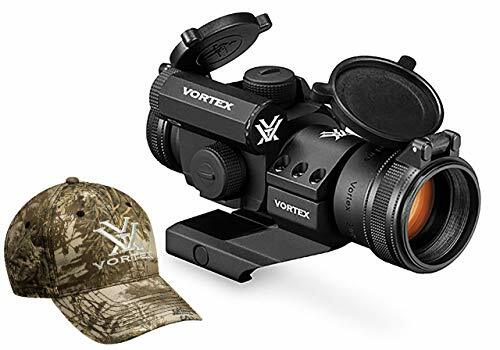 Vortex is better known as a global provider of hunting and shooting optics which typically puts fewer demands on the optics than depending on it on a battlefield or in a life-threatening tactical solution. This added dependability and hardened design are reflected in the price though. Don’t get us wrong. Both companies provide the highest quality products. They are somewhat targeting different uses and markets. If your life depends on your optic then in short, it’s an easy choice. Spend the money and go for an Aimpoint optic. If you want to high-quality red dot sight for a reasonable price to go on the range and shoot a few (or many) rounds then the Vortex Strikefire 2 is a fantastic choice. However, before just looking at these apparent choices, let’s have a closer look whether you should pick a Vortex Strikefire or an Aimpoint. To be somewhat able to compare apples with apples, we chose two Aimpoint sights that are on the low end of the price scale. Let’s first have a look at what you should consider. What should you consider before buying any of these scopes? There’re a few things you should look at before you make any buying decision. These points you should take into consideration whether you’re thinking of getting an Aimpoint, Vortex or any other sight on the market. A sight that offers everything but doesn’t allow you to adjust all those settings easily is nearly useless. Pretty much all reputable manufacturers have easy to use mechanisms to change any of the settings on your sights. Both Aimpoint and Vortex are in that category and you should have no problem to intuitively find the adjustment buttons and knobs and to dial in the settings you need quickly. You’ll hear ‘What you pay is what you get for’ quite often. And that is true. However, the amount you have to spend on a good sight also depends on your needs and requirements. If you need a sight that your life might depend on then picking a somewhat lower quality optic would be foolish. However, if in the worst case you might end up not hitting a target straight on while you’re out on the range then spending your life earnings seems foolish. In this comparison, looking at the Vortex and some Aimpoint sights, it’s pretty clear that Aimpoint is in the corner that your life can depend on while the Strikefire 2 fits more into the shooting range category. That’s not to say that the Vortex contender is a lousy scope in any way though! One thing upfront. Both Aimpoint and Vortex produce high-quality and durable sights. The differences are somewhat minuscule between the two but they do exist and they do favor Aimpoint. The most critical element when it comes to durability is that the sights are made from the highest quality material. The lenses need to be treated, so they are fog proof and reduce any glare from too much sun around you. Specifically, if you are using the sight in a tactical setting, you do want it to be built sturdy to withstand the environments. That means it should at least be waterproof down to a few feet. This might not be the most critical item if you want to use the sight exclusively on a shooting range. Lastly, if you intend to use a sight on a rifle with high recoil, you need to be sure the sight can withstand that recoil. Many sights and scopes are built shockproof, but that doesn’t mean that each is as good as the other. Again, on the range, you can continuously adjust if needed but if your life is in danger, you need to know that the sight will not let you down and that there won’t be any further adjustment necessary. Let’s have a closer look at these three sights in the following sections. The Vortex Strikefire hit the ground running when it was introduced. At the time it was an impressive optic that combines high-quality with an affordable price. These are the trademarks of all Vortex optics. After the original sight ended up somewhat outdated, Vortex renewed the model with the Strikefire II. It offers some improvements over the initial scope and is one of the most sought-after red dot sights in the consumer market. Even at its lower price point, it offers top-notch capabilities and quality. It is on the larger side of red dot sights and is intended for use on shotguns and rifles. Brightness levels can be regulated in 10 settings where two of these are for night vision use. The battery in the optics lasts around 6,000 hours if used on the lowest brightness setting. If you keep it on the highest setting, then you can expect approximately 300 hours of battery life. There’s also a feature to automatically shut down the sight if it’s not been used for 12 hours to conserve battery. It’s a sight that is built to withstand most environments without a problem. Whether you use it at -22 or at 140 degrees F, it won’t let you down. The sight provides lower 1/3 co-witness on AR rifles. The optic is water resistant but not completely waterproof. It’s not designed to be submerged, but you won’t have an issue keeping some rain out. The sight is sealed with O-rings to keep moisture and dust out. The Strikefire II is shockproof and can withstand rifles with heavy recoil. It holds zero well even with larger guns with heavier recoil. It’s overall not as tough and sturdy as an Aimpoint, but on the other hand, it is quite a bit cheaper. By no means is it a bad sight and if you want to use it on a range, then you are better off going for an affordable option as many of the Aimpoint choices seem overkill for that use. The ACO is the low-end red dot sight by Aimpoint. It is a sturdy design that you can trust, but it doesn’t have all the bells and whistles of other Aimpoint sights. The features that it’s missing compared to many other optics by Aimpoint are NVD compatibility and readiness, and ultra-long battery life. If you can live without those features, then this is a great sight if you need to spend more than double what you spend on the Strikefire II! The battery life on the ACO (Aimpoint Carbine Optic) is a solid 10,000 hours which is over one year of continuous use. The brightness level can be adjusted in 10 different settings from dim to extra bright. You know and see that you’re dealing with an Aimpoint sight when you consider that the sight has a temperature range between -60 to +160 degrees F. There’s pretty much no place on this planet where you couldn’t use it. The Aimpoint ACO has multi-coated lenses and surfaces to prevent any glare. It also is entirely waterproof and can be submerged to depths of 15 feet without any risk of damaging the sight. The ACO is shockproof and can be mounted on pretty much any rifle as it will deal with the recoil without a problem. It is more expensive than the Strikefire II but there’s no question it is built more robust and as such ends up being more dependable. Similar to the Vortex sight, the ACO provides co-witness with AR-15 backup iron sights with its fixed height mount. The Aimpoint Pro is a step up compared to the ACO. It offers a few more features and as such is slightly more expensive. This is a sight as you expect it from Aimpoint. It’s rugged and can handle the harshest environments. Similar to the ACO, it can be used in temperatures ranging from -60 to 160 degrees F. You’ll have a hard time finding any use for any sight that is outside of this range. The battery life is a whopping 60,000 hours in a constant on mode. That’s seriously long battery life as it translates to several years of daylight use. Compared to the ACO it does not only have ten brightness settings, but 4 of these are NVD compatible. The Pro is compatible with night vision devices and as such can be used in any light condition. The lenses and surfaces are multi-coated to prevent glare and act anti-reflective. The optics are entirely waterproof. They can be submerged down to 150 feet without problems. Being built as tough as it is, it’s undoubtedly shockproof and can be mounted on pretty much anything that shoots. There should be pretty much no gun available that would have a recoil heavy enough to get the Pro sight to skip a beat. Overall, it’s an excellent match for your AR-15! Which is better? Vortex or Aimpoint? There’s no straight answer on whether the Vortex or Aimpoint is better. It does depend on your requirements and budget. The Vortex is cheaper (by a lot), but it’s not that you’d get an inferior product. It’s not built as tough, but for the shooting range or recreational situations, it indeed is a well-made sight. Any of the Aimpoint sights beat the Vortex on durability and toughness. However, they both are a lot more expensive than the Strikefire 2, and if you’re not continuously using the sight or need it to protect your life in tactical or military situations, then they might be overkill. If you want to pick a sight that you’ll never have to worry about again as it’ll never let you down and that is durable and will last for a long time then pick the Aimpoint. Depending on whether you need NVD compatibility or not you can select either one of those two optics. Do you use any of these sights? Have any thoughts about them or other comparable optics? Please leave a comment below! We’d love to hear from you.